LOUISVILLE, Ky.--(BUSINESS WIRE)--Kenworth now offers the Eaton Fuller Advantage™ 10-speed automated transmission as an option for the Kenworth T680 in long-haul or regional applications. 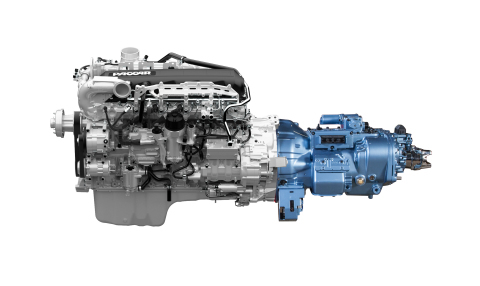 The optimized powertrain combination of the PACCAR MX-13 engine integrated with the Eaton Fuller Advantage™ transmission provides up to a 2 percent fuel efficiency enhancement. Kenworth is displaying the Eaton Fuller Advantage™ this week at the Mid-America Trucking Show. The Eaton Fuller Advantage automated transmission senses the load demand on the engine and selects the best shift points to match vehicle weight, road grade, engine torque and throttle position. It also has unique control logic and a small step gear ratio that enables downspeeding in top gear Overdrive, while allowing a quick down-shift to Direct-Drive 9th gear required when pulling a grade. “The transmission is very intuitive – the optimized performance gets the absolute most out of the truck when it comes to shifting and fuel economy,” said Baney. The PACCAR MX-13 engine with the Eaton Fuller Advantage 10-speed automated transmission is the standard combination for the new Kenworth T680 Advantage, which combines optimized engine and transmission with aerodynamic enhancements for even better fuel economy. For more information about the new Eaton Fuller Advantage 10-speed automated transmission, contact your Kenworth dealer or visit www.Roadranger.com/MX-13. Kenworth now offers the Eaton Fuller Advantage™ 10-speed automated transmission as an option for the Kenworth T680 for long-haul or regional applications.